Thanks to Bill Ohlsen for suggesting this hotspot and providing photos and tips for birding at the location. 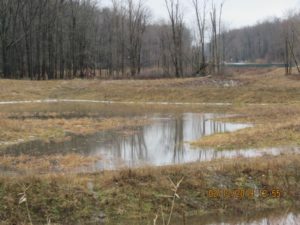 The Westlake Wetland, 16 acres, is the result of a restoration project to preserve and protect the riparian corridor of the Dover Ditch (a tributary of Cahoon Creek). The wetland is located on Cahoon Creek and adjacent to Evergreen Westlake Cemetery. Thanks to Cindy Antenucci for suggesting this hotspot in the Cuyahoga River-Lower Important Bird Area. Brust Park is also on the Summit Bike and Hike Trail and is a parking area for the trail. Thanks to Ethan Kistler for suggesting three hotspots in Trumbull County. The Elm Public Hunting Area is in the Mosquito Creek Corridor Important Bird Area. The other two hotspots are located on the Mahoning River. Thanks to Kaden Katanic for suggesting this hotspot at the Barn Restaurant just outside Smithville. Thanks to Brandt Schurenberg who added a photo and tips for birding this location. Thanks to Bettyann Nagy for adding photos to two hotspots in Mill Creek Park in Mahoning County. She also has given us tips for birding at the Suspension Bridge. I discovered this week that the contact form you can use to send suggestions about this website was not properly set up. If you tried to send a message about the website via the contact form and did not get a reply, please resend your message. I usually respond to messages promptly.